Rutland township was formed from the townships of Jackson and Sullivan, in the year 1828. It is bounded on the north by the township of Jackson, on the east by the county of Bradford, Pa., on the south by Sullivan and Richmond townships, on the west by Richmond and Tioga townships; its mean elevation above tide is about 1,500 feet. Mill Creek is its principal stream, which flows westward and discharging its waters into the Tioga river. The lands in the township are under a good state of cultivation, with some of the finest farms in the county. The chief pursuit of the inhabitants is farming. 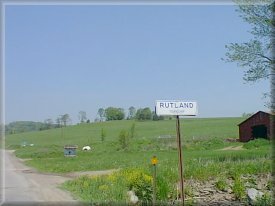 Its first settlers were largely from the Green Mountain State, and hence hey name their township Rutland, in honor of the county from which they came. In the year 1829, when the first assessment of the township was made by William Howland, assisted by Ezra Wood and William rose, the taxables were Stewart Austin, John Argetsinger, Isaac Benson, Ephraim Bryant, Bethuel Bently, Ebenezer Bacon, Daniel Bunker, Halsey Burton, Hiram Benson, Green Bentley, Jacob Benson, Caleb Burrell, Silas Burrell, Sylvester Benson, Hiram Beeles, Constant Bailey, Peter Burrell, John Benson, Joseph Beeman, Johnson Brewer, John Britton, Peter Backer, Abraham Brown, W. D. Bacon, Sylvenus Benson, William M. Corey, Jabez M. Corey, Asa Crippen, David Crippen, Sydney Clark, Cornelius Clark, Seeley Cook, Hiram Cooley, Edwin Currie, Joseph Clark, Samuel Clark, Lemuel Clark, Harris Corey, John Crippen, Enos Curtis, Samuel H. Coates, Isaac Clymer, John Drake, James Dann, James Dann, Jr., John B. Dann, Joseph Fletcher, Judah Gifford, Nathan Gifford, Nathan Goodwin, Gardiner Gould, Jonathan Gray, Eli Gray, Justus Garretson, ___ Goff, Calvin Hathaway, Hosea Howland, William W. Howland, John R. Howland, James Husted, Isaac Hager, David Huntley, Calvin W. Handmer, Thomas Johnson, James Job, Daniel King, Benjamin Lawrence, Nathan Newberry, Sylvester Newberry, Lucinda Newberry, Elisha Nash, Levi Osgood, Richard Lamberton, David Prutsman, Erastus Rose, Virgil Rose, William Rose, Levi Rose, Samuel Reynolds, D. B. Reynolds, John Reynolds, Avery Smith, Jesse Smith, Betsey Sherman, Jacob C. Stout, Harvey Smith, I. S. Smith Isaac Smith, Cornelius Sharp, Andrew Sharp, Herman Soper, Jefferson Sherman, Robert Searles, John Selover, John Snyder, Silas Smith, E. Strong, John Slingerland, Tunis Slingerland, Albert Slingerland, William Turner, William Updike, John Updike, Henry Updike, Abram Updike, Jonathan Wood, Solomon Wood, William Wolf, Ira Weldon, Daniel Wattles, Seth Ward, William M. Ward, Justus Wood, Lewis H. Weldon, Ezra Wood, Solomon Wood, 2nd, James Rosell. Roseville Borough formed from Rutland was organized Feb. 3, 1876. Its first officers were: Burgess, Sandford Johns; Council, G. W. Sherman, Myron Mills, L. C. Benson C. L. Strait, John M. Barden, Daniel Watson; Justices of the Peace, Daniel Watson, John D. Longwell; Constable, Josephus Stout; Street Commissioner, D. W. Hibbard; Treasurer, Myron Miles; Assessor, Warren Rose; Assistant Assessors; D. W. Hibbard, Lyman C. Benson; Judge of Election, G. W. Soper; Inspectors, D. W. Stout, H. M. Reynolds; Auditors, C. L. Strait, Amos Mansfield, H. H. Soper. The assessed valuation of property in Rutland township and boro is about $250,000—the real value is about $750,000. The first school house in Rutland was on the Mill Creek road. The first settler at Roseville was William Rose, in the year 1806. There are now twelve school houses in the township and borough. Erastus Rose, son of William Rose, lived sixty nine years in Rutland. Harris Soper was one of the early school teachers in Rutland township. Capt. E. R. Backer, of Rutland, raised a company during the rebellion. There are five churches in the township of Rutland and Roseville boro.